Fintech and financial services represent the most disrupted industry by the blockchain, considering the various data storage and transaction processes where blockchain technology have either been prescribed, tested or fully implemented. The rate at which startups are emerging around the finetech industry and their attempt to find interaction and connectivity with existing institutions is giving rise to even more innovations to manage these associations, mostly B2B. 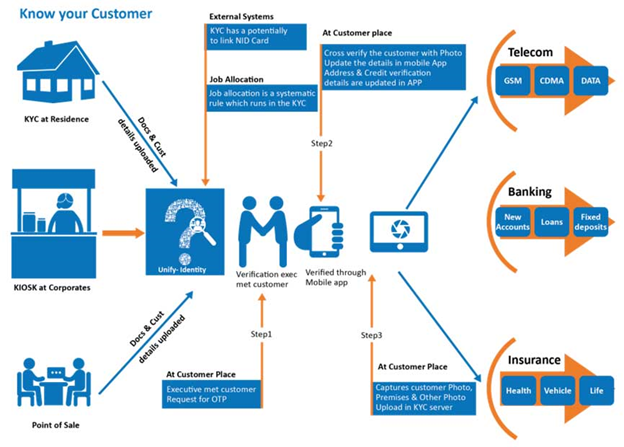 Know your customer (KYC) is the process of a business identifying and verifying the identity of its clients. The term is also used to refer to the bank and anti-money laundering regulations which governs these activities. KYC compliance has become a globally demanded regulation that is enabling governments and major institutions to fight crimes and forms of graft both at local and international levels. This stems from the fact that most crimes, if not all are money related, and monetary transactions are some of the easiest ways to track human activities in most climes. However, besides reasons of enforcement, KYC procedures are also necessary for the security of assets and properties of individuals, especially in a world that keeps becoming increasingly digital by the day. KYC laws are national and international in scope, representing a huge and diverse group of relying parties including (without limitation) the following: coin exchanges, fintech startups, money transmitters, real estate companies and agents, precious metals dealers or storage facilities, fiduciaries, corporate services providers, lenders, banks, securities firms, lawyers, accountants, nonprofit foundations, professional service providers, notaries, governments, insurers, re-insurers, financial institutions, and generally any legal entity or natural person dealing in money or finance. KYC is not an option, it is mandatory, with civil or criminal sanctions imposed by both local and international bodies for failure to comply with KYC laws. Unfortunately, for many individuals and companies, from small startups to large corporations, as well as relying parties, KYC compliance is an expensive and painful reality. For relying parties, KYC is expensive and time-consuming. The average annual, recurring cost of KYC compliance is USD 60 million for the average bank, but may be up to USD 500 million for others. This cost is necessarily high because relying parties cannot quickly and easily access up to date identity data, validate the data or screen it to satisfy their regulatory requirements. 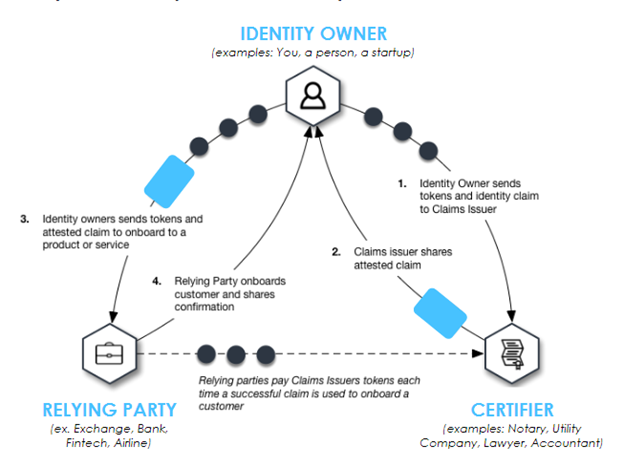 Therefore, relying parties must send new requests to the identity owner and must treat every identity owner as a ‘blank canvas’ and force them through the a fully robust KYC process. The time and effort expended by one relying party to perform KYC validation checks cannot be reused or recycled and is not leveraged in future requests. If the identity owner decides to change service providers, these same checks need to be completed by the new relying party. The identity data is not “ported” to the new service provider and so ends up being held by multiple providers, many of whom hold redundant, yet still highly sensitive identity data, for individuals who are no longer their clients or customers. The high cost involved in this procedure creates a barrier to exit when changing service providers, leading to an uncompetitive environment, to the detriment of identity owners, fintech startups, and innovation, generally and increases the risk of identity theft for the individuals. Furthermore, those who lack identity documents issued by a national government are excluded from commerce completely because of their inability to comply with KYC regulations. Although certainly well-intentioned, KYC regulations can easily exclude legitimate market participants and slow down international commerce. This problem could be easily solved if there was a way for existing KYC data to be linked, reused, and easily ported across borders in a compliant manner. To solve these problems and alleviate the difficulties associated with the present style of identity management, innovations like SelfKey’s Self-Sovereign IDentity (SSID) that is implemented by using the blockchain introduces a better managed identity system where control and management is decentralized. The SelfKey system removes identity owners from the legacy systems of paper-based documents and moves them into a digital identity with privacy, security, transparency and individual rights. This system is built using blockchain technology, with the corresponding keys held in a digital identity wallet. This enables flexible identity management platform under the full control of the owners and and a native token called “KEY” which enables the SelfKey ecosystem to exchange value and information in an efficient, fully-digital, self-sovereign manner. Through the identity wallet, users access to their identity attributes and documents are stored in their device. Users can share these documents with certifiers such as notaries, to certify these documents, paying with KEY tokens. Also, users can share these certified documents with service providers listed in the SelfKey marketplace, and apply for and buy their products and services paying with KEY tokens. Citizenship by investment applications, real estate for citizenship by investment, residence permits applications, company incorporation, foundation setup, trust setup, bank account applications, prepaid payment wallets and virtual current accounts signup, money transfer services signup, coin exchanges signup, precious metals purchase, selling and storage services, token sales whitelist signup. Also,the identity wallet will be available in desktop and mobiles. The effectiveness of global B2B transactions is highly dependent on the efficiency and security of data management. Considering the existing setbacks and inherent limitations of the centralized methods currently employed, adopting a decentralized system that runs upon the benefits provided by blockchain technology could be the long awaited solution that the ecosystem deserves.